Such a Pretty Girl is a spin-off from Tess Diamond’s O’Connor and Kincaid series. It can function pretty well as a standalone, even though the events from the previous books are mentioned fairly often. I was curious enough to buy a copy of Dangerous Games and learn about those secondary characters in greater detail. Having read both, I can say that I like Maggie and Jake from Dangerous Games even more, but Grace and Jake aren’t far behind. As a self-proclaimed romantic suspense addict with a taste for danger, Diamond understands the ins and outs of the genre and she uses her vast knowledge to her advantage. Such a Pretty Girl is a bit heavy on the romance for my taste. Not that there’s anything wrong with that, but the serial killings felt more like a backdrop at times, just something to fill the pages between steps in the relationship. There were several things that would have bothered me in a straight up mystery/police procedural, but they bothered me less when I realized romance would be at the forefront. Both Jake and Grace are very competent, and their interactions are a marvel, with a deep connection and understanding quickly forming between them. At times, Jake struck me as just a bit too perfect, tailored to precisely fit Grace’s needs and personality. Some friction would have been better, but at least their chemistry was off the charts. I went into this expecting something far stronger in the mystery department, but I wasn’t too disappointed with what I ended up reading. 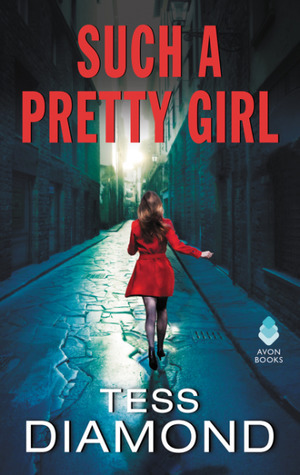 Such a Pretty Girl is dark at times, very romantic, and fast-paced and it flows smoothly from start to finish. It may not be the best developed mystery I’ve read, but it’s an attention grabber, and that’s more than enough in these scorching summer months. Fans of romantic suspense should give it a try. oh I am sorry to hear that this was disappointing as I have been hearing some good things about this author. Such a mysterious cover too. I think I would enjoy this, especially if I wasn't expecting too much mystery and more romance. Great review Maja! Bummer. I was hoping for more mystery/suspense than romance. Glad you mostly enjoyed it. I call this type crime fiction and I used to adore it. Sadly I'm burned out on it. I keep trying to get into it again but it never works. I am not sure that romance blends well with serial killers, especially if the romance is heavy.